Next up, The Merrywell! We picked the establishing shot in honor of Movember, support your friends if they are growing a Mo this November! This place was not part of the initial list but was added as a Melbourne Fried Chicken place while Hollywood was reviewing an amazing burger blog. The Merrywell burger was highly recommended and it did indeed meet Hollywood’s burger expectations. Merrywell is a giant fusion of a Southbank bar/diner-restaurant venue that has loads of goodness to offer at the far end of the Crowne. 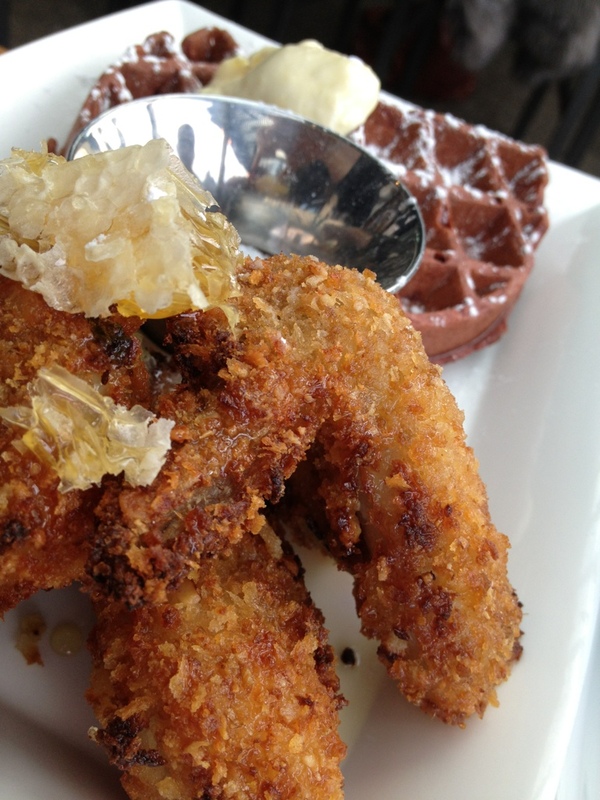 Its menu boasts having fried chicken and waffles, mac-n-cheese, and mashed potatoes that seemed guaranteed to set the scene for a good Melbourne fried chicken feast. 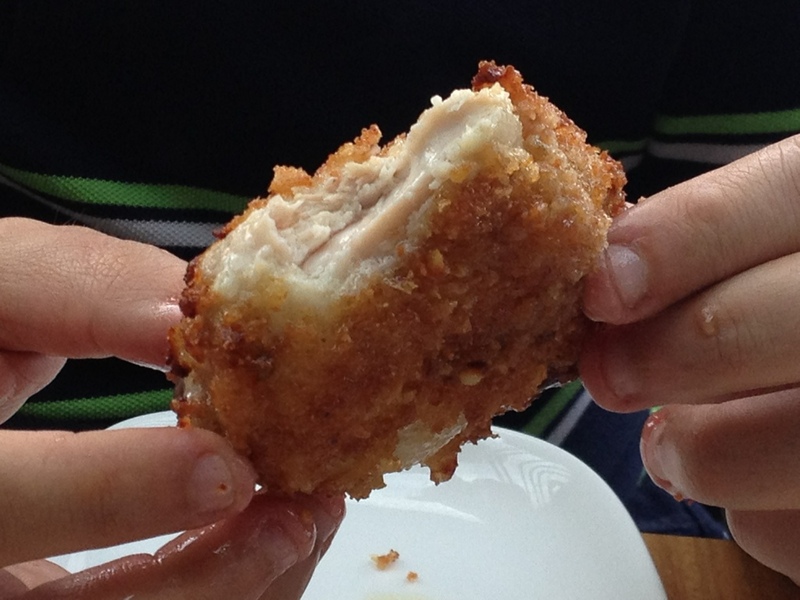 We were pretty excited to review our first Melbourne Southern-style fried chicken. We arrived at the Merrywell on a Friday to find it catering to the after work drinks crowds. The place was busy with many reserved tables but still had room to accommodate Hollywood and the Chick outside on the 1st floor deck overlooking the Yarra. It took us a while to grab a waiter’s attention and placed our order of fried chicken with waffles, mac-n-cheese, mashed potatoes, and steamed asparagus (The Chick believes food that involves something green is automatically healthier). The food arrived quickly given the crowds! 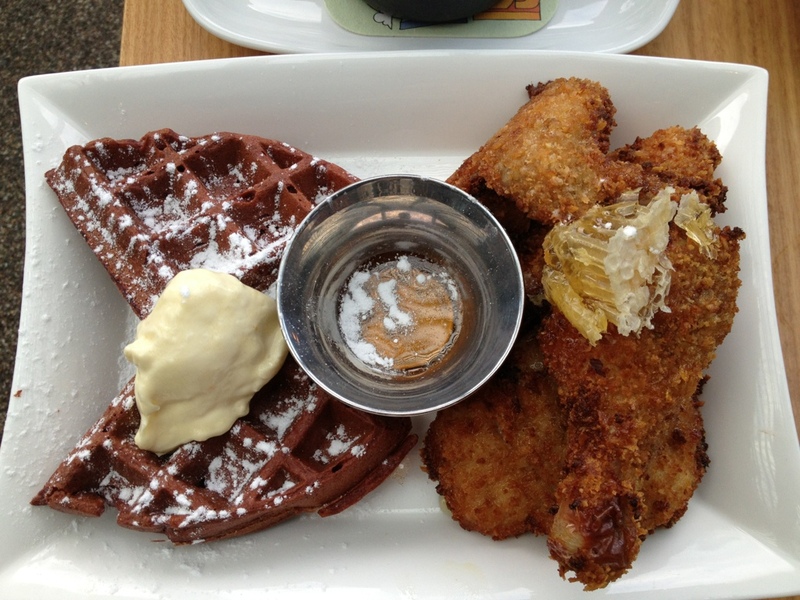 The chicken order consisted of 4 chicken pieces topped with a decorative bit of honey comb accompanied with chocolate waffles covered in a lemon cream and with a honey dipping sauce. Hollywood attacked the fried chicken with a big bite and confusion sunk in. 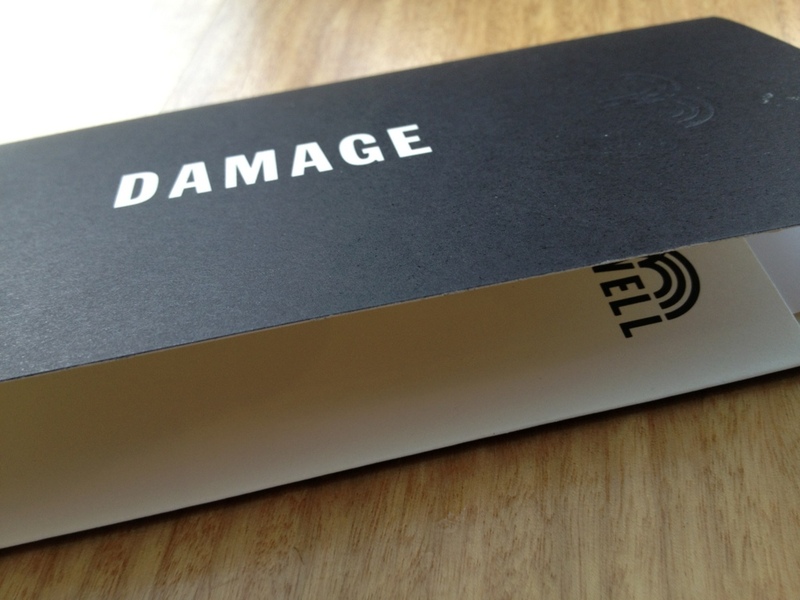 “How am I going to review this!”. His confusion stemmed from his concept of fried chicken. Fried chicken to Hollywood was all about crispy savory mountains of fried chicken that challenge a man to eat like no tomorrow, Neanderthal style. By contrast the Merrywell’s honey covered chicken gave a rather sweet chicken that Hollywood and the Chick weren’t accustomed to. 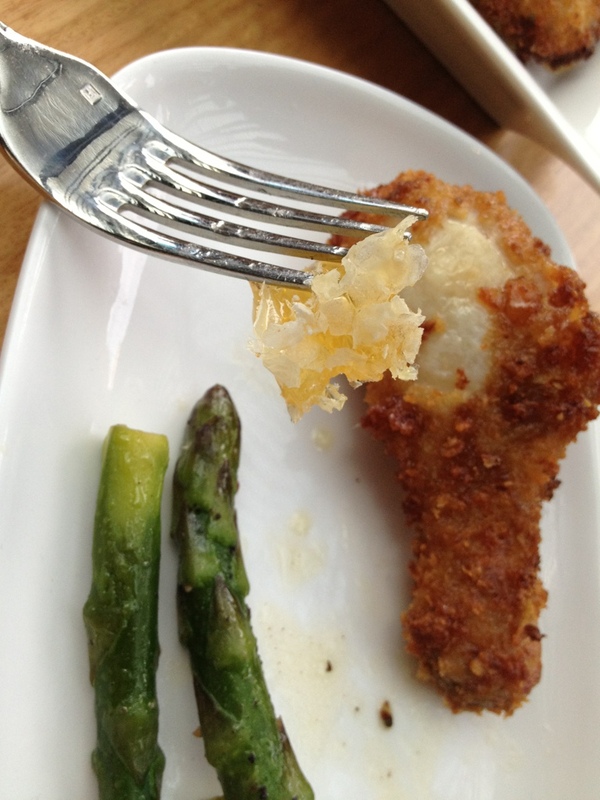 The Chick had seen honey as a side sauce, but never integrated into the breading. The chicken pieces were bigger than Korean style fried chicken and more closer to southern style size. It was moderately hot but not steamy, a bit fatty and pan (rather than deep) fried. The skin didn’t seem to be double coated and likely with honey in the mix. The Chick found the bigger pieces dry, solved quickly by a dip in the potatoes. While this seemed like a recipe catering to its own unique palate, there were no leftovers! 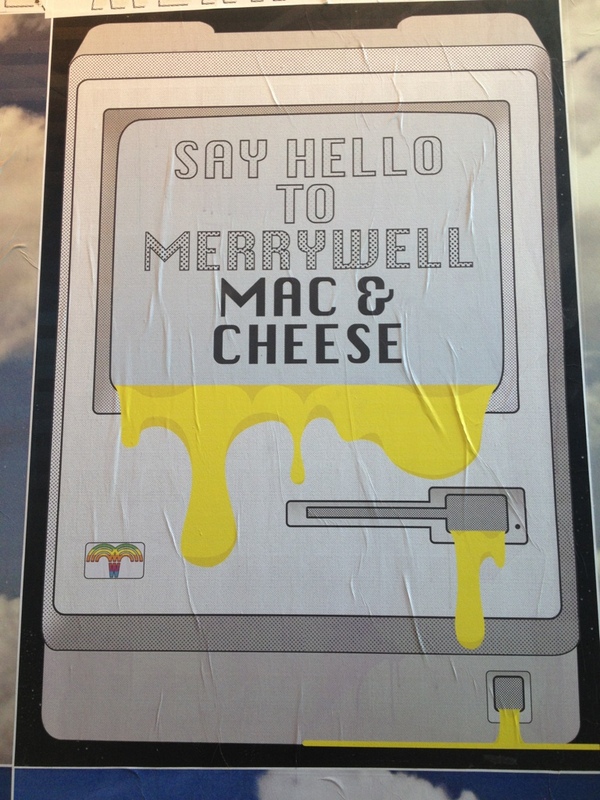 One of the other reasons why the Merrywell was considered was the mac-n-cheese. 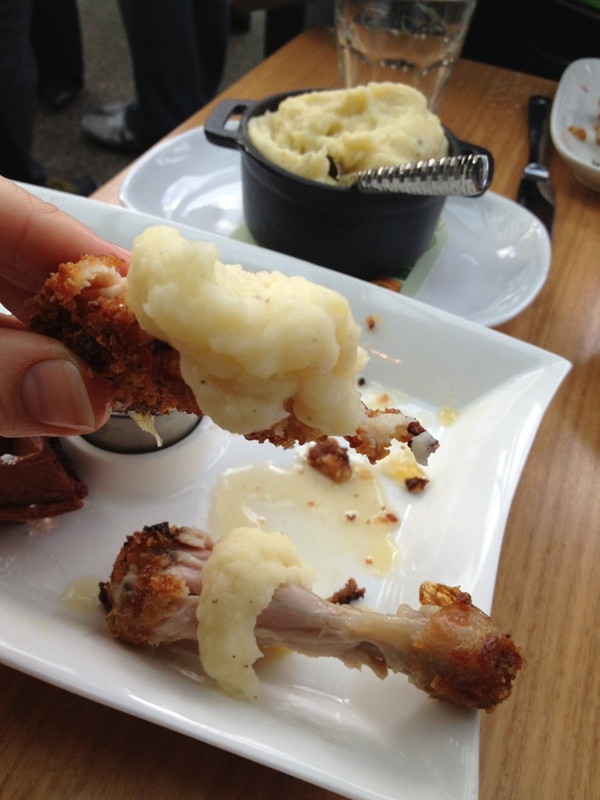 The Chick has an undying love for mac-n-cheese and considers it the creme de la creme of comfort foods. 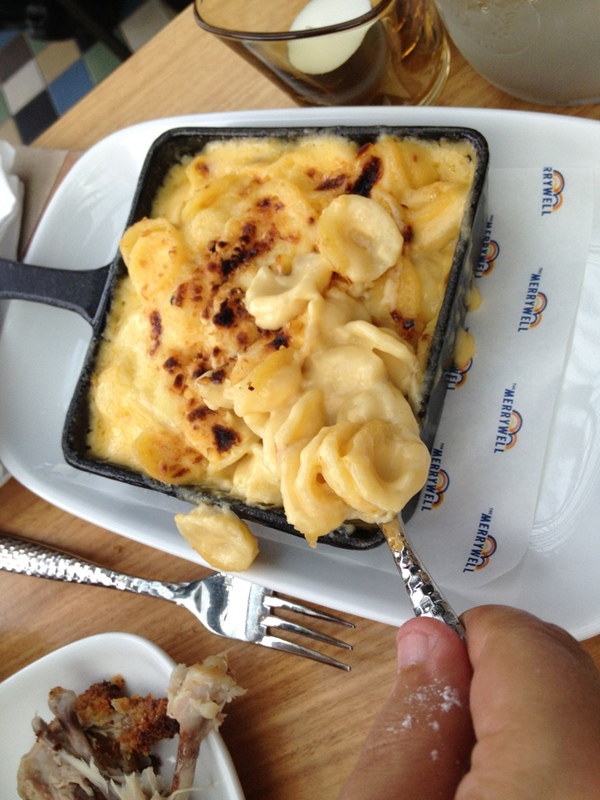 One of her most famous quotes on the topic of mac-n-cheese is, “It is the only food that I will eat even if it comes from a box.” The Merrywell version was creamy with large shells but the Chick preferred it with a bit more spices, nevertheless, there was nothing left but the skillet. The mashed potatoes were good, creamy and had a peppery flavor which sat well with Hollywood especially as a sauce to dip the chicken in. The steamed asparagus was nice and added a fine healthy balance as long as you ignore the buttery sauce over it. In conclusion, the fried chicken had a sweet flavor which isnt what Hollywood and The Chick crave when having Melbourne Fried Chicken thoughts. Don’t consider this place for an authentic Southern-style fried chicken but it is still a good venue for after work drinks, good food and its Merrywell burger is the real reason to make the trip. As you might expect from a Southbank venue, it would not qualify for cheap eats, but at least they were honest about that when they brought the bill. The Chick gave 3 clucks for the chicken, 8 for the place in general.